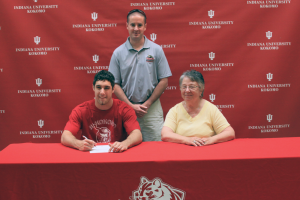 Spencer Khrin signs with IU Kokomo as head coach Jace Thompson watches. KOKOMO, Ind. – Last season, Indiana University Kokomo men’s basketball coach Jace Thompson often talked about the young programs lack of playing experience. With a year under the Cougar programs belt, the experience is building – especially when Thompson grabs key transfers from Bethel College, Ancilla College and Joliet Community College. Last Thursday, it was Bethel transfer Spencer Khrin’s day in the Cougar spotlight. The 6-4 Khrin played in a reserve role for the Pilots the last two seasons after starring for a Southwood team that advanced to the Class 2A Final Four his senior season. In the regional final against Guerin Catholic, he scored 38 points and was invited to the Top 60 workouts after averaging 19.9 points and 7.2 rebounds per game. He guided Southwood to 52 wins in his career and left as the program’s third all-time leading scorer (1,249 points) and a three-time All-Three Rivers Conference performer. Khrin said he will be expected to come to Kokomo and help the less experienced players by being a leader. He also discussed the opportunity he will have to build a young, hungry program like Kokomo’s. And as excited as Khrin is to come to Kokomo, Thompson is equally excited about the prospects of bringing Khrin’s talents to the local program. Thompson also talked about the hard work the IUK coaching staff has put in during the off-season, resulting in a solid second-year recruiting class. He said they really wanted to bring in some “impact players” like Khrin. “We had a couple of players that we wanted to get because they were impact players,” said Thompson. “Khrin was one of them. We are also raising the level of intensity on the floor. We are recruiting good ball players who are not worried about numbers. Thompson broke down the 2012-2013 recruiting class, which are all verbal commitments until they sign on the dotted line with the Cougars. “We nailed every single need we had – size, strength, all-around ability, and experience. We hit every target and I give my coaches credit for that. We have four freshmen coming: Tyler Talpas of Union (Dugger) High School, John Capps and Ben Constable from Western, and Jalen Tinder from Kokomo. Talpas is a high-scoring guard, averaging 21.8 points per game and is a member of the school’s 1,000 Point Club. “Joby Renbarger (transferring from Ancilla College) is a 6-7 beast and he is hard to handle,” said Thompson. “He is the type of player who is a matchup problem. He will go inside and outside and will be hard to guard. The Cougars are scheduled to open the 2012-2013 season on October 30, with a road trip to Judson University in Elgin, Ill. Judson appeared in the NAIA National Tournament in 2008 and 2010, and will provide Coach Thompson and his Cougars with instant analysis of how the off-season preparation went. The rest of the IUK schedule will be released later. This entry was posted in Cougars, Indiana University, IU Kokomo. Bookmark the permalink.